Coach Carl Davis and No. 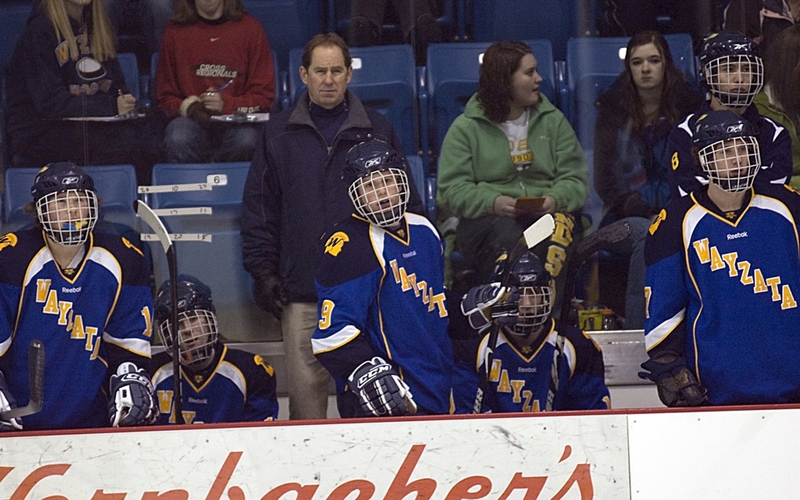 6 AA Wayzata attempt to be the first team to knock off top-ranked and unbeaten Minnetonka. Who’s going to knock off Minnetonka? For the second straight week, the Hockey Hub’s game of the week features a Classic Lake powerhouse hoping to beat the state’s only unbeaten team. So far, it doesn’t appear anyone has a terrific chance to best topple No. 1 AA Skippers (18-0-0), particularly after they routed No. 2 Edina last Saturday, 7-1, but the latest team to take a shot will be No. 6 AA Wayzata (13-2-1). Both teams are 2-0-0 in the Classic Lake Conference and of course, have yet to meet each other. The Trojans beat Edina (1-0) and Armstrong (7-1) in its first two conference games, while Minnetonka blitzed Edina and Hopkins (5-2) in its first two games in the league. Wayzata is stingy defensively, allowing just 1.75 goals a game and recently shutting out perennial state power Moorhead twice in a week. Goaltenders Alex Clayton (4-1-1, 1.84, .920) and Andrew McIntyre (9-1-0, 1.61, .912) have been sharing duties. Clayton hasn’t allowed a goal in more than two games, including the shutout of Edina, while McIntyre was in goal for both blankings of the Spuds. They’ve combined for six shutouts on the season already and are certainly helped by a stout defensive corps that includes junior D.J. Jones (4-14-18), senior Lucas Whelan (5-10-15), junior Marc Richards and the appropriately-named (but not pronounced that way) sophomore Miles Death. The Trojans aren’t as high-powered as Minnetonka, but they do have good scoring balance, led by the underclassman line of juniors Tony Cameranesi (9-16-25) and Tyler Klein (8-4-12) and sophomore Mario Luca (10-13-23). Scott Holm (13-12-25) leads the team in goals and is tied with Cameranesi for the points lead. Danny Walsh (5-11-16) and Seth Barnes (3-9-12) have also tallied double-digit points, two of the eight Trojans to do so already this season. Minnetonka survived the four-week absence of star forward Max Gardiner, a University of Minnesota recruit, without a hitch. Now that he’s back, the Skippers appear unbeatable, scoring 5.7 goals a game and allowing just 1.3. Minnetonka is loaded in all three zones – offense, defense and goaltending. Gardiner (12-19-31 in just 13 games) is the most recognizable of the forwards, but the young crew of freshman Max Coatta (15-13-28), juniors Derek Frawley (12-22-34) and Connor Ryan (5-12-17) and sophomores Sam Rothstein (5-8-13) and Erik Baskin (4-8-12) have stepped up their games and – for a team that is unbeaten – are probably underrated. Junior Thomas Schutt (13-12-25) has also found his scoring touch and makes the Skippers even deeper up front along with seniors Jake Thornberg (6-7-13) and Tommy Lundquist (3-7-10). In all, a dozen different Skippers already have scored in double figures. On defense, everyone knows about the three DI recruits in high-scoring Justin Holl (15-10-25) and Andrew Prochno (7-25-32) and powerful defender Troy Hesketh. But the Skippers are also getting good minutes from sophomore Michael Prochno and senior Jake Rossman. Senior Jim Kruger (14-0-0, 1.36, .941) is the unsung hero of the team, it’s last line of defense for the past three years and the all-time school record holder for career goaltending victories. He’s steady and calm at all times and has come up with big saves on the rare occasions he’s been needed. The top two teams in the Lake Conference square off for the second time in just 10 days. Back on Jan. 16, the Eagles soundly handed Eagan its first loss against a Minnesota high school team this year, 7-1, behind a hat trick and three assists from super junior Kyle Rau. Rau is as hot as any player in the state right now, with 18 goals in his last seven games (including two three-goal and two four-goal games). The Eagles still lead the conference with a perfect 10-0-0 record, while Eagan is right behind at 9-1-1. If it’s the Section 8AA race, it’s bound to come down to Moorhead and Roseau. At least, for the past 14 years that’s the way it has played out. This winter, the Rams can take control of the section race with a victory at home Tuesday night. Roseau beat Moorhead 4-1 in the Spuds’ back yard back on Dec. 15 and has been rolling, with a 12-1-1 record in its past 14 games. Moorhead may have an advantage as the Rams’ Adam Knochenmus hasn’t been available since the holidays because of injury. But even in his absence, Roseau has continued winning, although the team’s scoring production has gone down. It’s the first of two meetings this year between the intense Tri-Metro rivals, both of whom are ranked in the top 10 in Class A (Breck at No. 2, Blake at No. 9). Both are still unbeaten in the Tri-Metro, as well, so there are plenty of bragging rights in the conference, in Section 2A and in the west Metro private school war. Expect to see a great goaltending battle between Blake’s young Ryan Hayes (10-5-0, 1.98, .914) and Breck’s experienced John Russell (9-2-0, 1.79, .928). Andover is trying to make a Northwest Suburban double dip over Duluth East and in the process, pass the Greyhounds in the Section 7AA seedings. Back on Jan. 19, Elk River bested East and now Andover hopes to repeat the feat and give the section tournament “southern exposure.” East has played one of the toughest schedules in the state since Christmas, but hasn’t had much luck gaining traction with a 3-4-2 record in that stretch. Andover has already won 12 games, but hadn’t beaten a true top team until edging No. 10 AA Osseo 2-1 last weekend. This game could cement the Huskies as a top-10 team. How will No. 2 AA Edina rebound from a tough week in which they lost both games, including a resounding 7-1 thumping to Minnetonka? The Hornets scored just one goal in the two games (the other a 1-0 loss to Wayzata), and will certainly need to get its offense going against Hopkins and super goaltender Alex Fons in order to avoid a repeat. The only problem is other than perhaps leading goal-scorer Charlie Taft (11-7-18), the Hornets don’t have a true go-to player. No other Hornet has double-digit goals. Hopkins, on the other hand, most certainly does have a go-to guy in senior Archie Skalbeck (24-21-45) and just gave Minnetonka a tough game before losing, 5-2. Is Jefferson coming out of its funk just in time? It’s tough to say based on the Jags’ last two games, which were against the bottom of the Lake in Chaska (7-1) and Kennedy (14-1). Jefferson hasn’t had much trouble scoring goals in its victories, but has fallen shy in its losses of late. If the Jags get off to a fast start against Apple Valley, they could roll. If not, the Eagles might just pull off the mild upset. A young Apple Valley team – its top two goal-scorers are freshman Hudson Fasching (16-11-27) and sophomore A.J. Michaelson (10-8-18) -- has won four in a row and is just one point behind the Jags in the Lake Conference standings. Blaine continues to lead the Northwest Suburban Conference standings, while Osseo is one of five other teams that still harbor a realistic chance to chase down the Bengals in the final weeks of the season. The Orioles' hopes were hurt with a recent loss to Andover, however, coupled with a tight 3-2 loss to Blaine way back on Dec. 10. The Bengals could deliver the knockout blow Thursday night. The top two teams in the Central Lakes Conference get together to settle their differences. Sartell leads the CLC at 8-2-1, but has played more games than Tech, which is at 7-2-0 and just a point back entering this week. The Sabres had struggled in recent games before shutting down Fergus Falls 4-0 in their most recent game. Tech also beat Fergus Falls (8-5) last week, although it was hit hard in a 9-1 loss to Moorhead last Thursday. It still seems strange that public school hockey in Minneapolis is down to these two programs, not named after any particular school in their co-operatives, but instead for the side of town they now represent. But it is good to see the tradition of hockey go on in the city – and the hope that it may continue to do so in the future. West has the edge in this season’s bragging rights, beating East 6-3 back on Dec. 15, with Newton Fuller netting two goals for the winners, while Peter McMahon had two for East.